Seeking fulfilment in life, realising that there is more to life than working, Yoke Ching retired as a Chartered Accountant a few years ago. After all, her children have become more independent and she wanted to explore more. “I have reached the stage where I realised there’s more to life than just working and I want to help the less fortunate within my abilities,” she says. Yoke Ching’s journey with National Silver Academy (NSA) started when her sister asked her along for a voice training course with the Singapore Association for Continuing Education (SACE). Her enjoyable experience then led to her wanting to attend more of such courses. As Yoke Ching was particularly interested to learn more about health and wellness, she went on to attend courses such as Food for Healthy Ageing and Mindfulness under NSA. Yoke Ching recognises the importance of upgrading and equipping oneself with skills. After observing how stressful her daughter gets during her exam periods, Yoke Ching wanted to help her relax. This prompted her to attend an acupuncture point massage course in Mandarin to pick up skills to massage her daughter. As a diligent student, Yoke Ching was determined to do well despite her lack of proficiency in Mandarin and persevered by putting in extra effort during class. Yoke Ching’s hard work paid off eventually as she successfully completed the course. Besides upgrading herself, Yoke Ching is also passionate about wanting to do more to contribute back to society. Currently, she volunteers regularly at RSVP as a mentor, reads to underprivileged kids in KidsRead (a reading programme under NLB) and is a registered befriender with Brahm Centre. 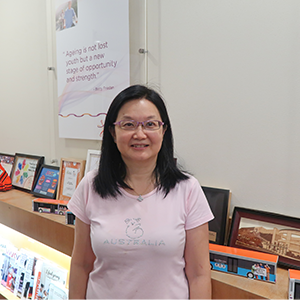 As Yoke Ching is keen to do more, she plans to take up more NSA courses like Counselling, Drama and TCM, which she believes would benefit her when she volunteers in the future. All in all, Yoke Ching feels very fortunate to be able to attend various programmes that helps her in ageing positively, with much support from her family. She strongly believes that a positive mindset on ageing is half the battle won! **Special thanks to Madam Boey Yoke Ching who accepted our interview, we wish her all the very best in her lifelong learning journey.